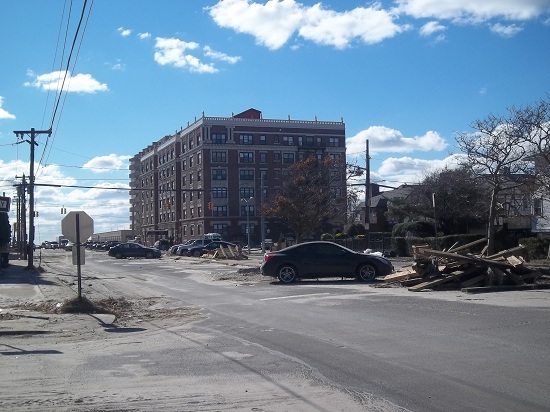 we know so many are still too overwhelmed with issues from Sandy to deal with this. 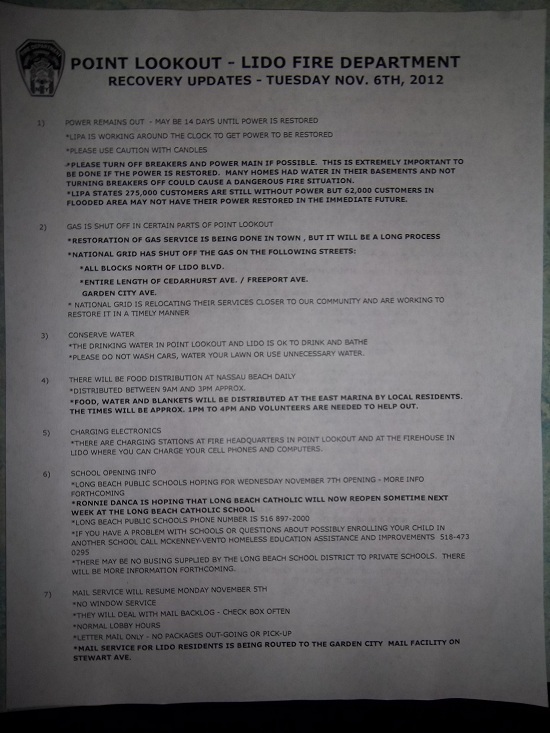 For anyone else interested, this is the last planned public…anything, on this issue. You can see the science for yourself and come help discuss solutions to our shrinking drinking water supply. This is extremely important for our local area, as early warning signs are showing potential problems with our local water for the future, and the island in general. We need a common solution: one that manages, is responsible for and fights for protecting and preserving our water resources. They’re the only ones we’ve got! 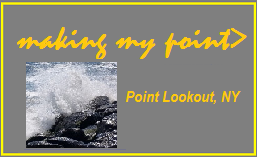 The burning question: Point Lookout, Lido Beach, Long Beach- Rumor Busted! Rumor has it someone was talking to an experienced disaster relief person from out of state. I spoke to officials from the Fire Dept: this is absolutely untrue and they would fight it if it were to be. 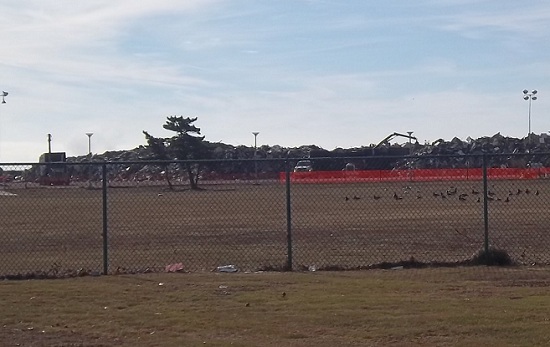 The county’s temporary garbage storage at Nickerson Beach. 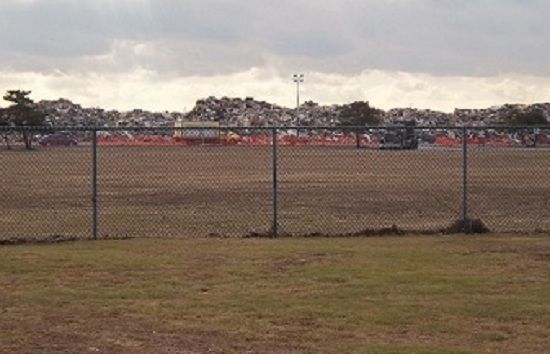 Taken on 11/20/12 shows the pile several feet higher than the garbage truck. 15 feet, I’d guess. you just cannot get the scope of it from these pictures but it is about as deep as it is wide, covering almost that entire lot. 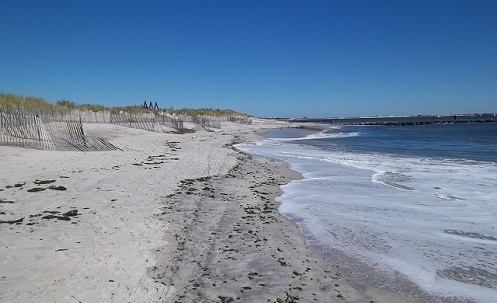 Nickerson Beach. Taken on 11/28/12 shows the pile grown dramatically from last week. well over 20 ft. 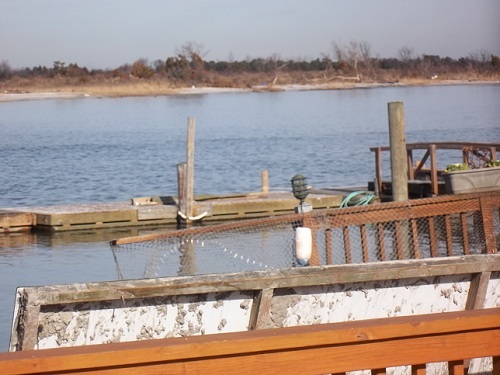 The bay is being flooded daily with untreated sewage from Bay Park in East Rockaway, worse than the “normal” amount of sewage Nassau County has been illegally dumping into the bay. Last Tuesday the north easterly wind had everyone in town’s saying : “what’s that smell” again. Fire officials went out and checked-it’s not methane, it’s probably seaweed rotting again in the cove and elsewhere-wherever it washed up to. That problem is being fixed… The town may be dredging and pumping sand back in as we speak in the cove area. 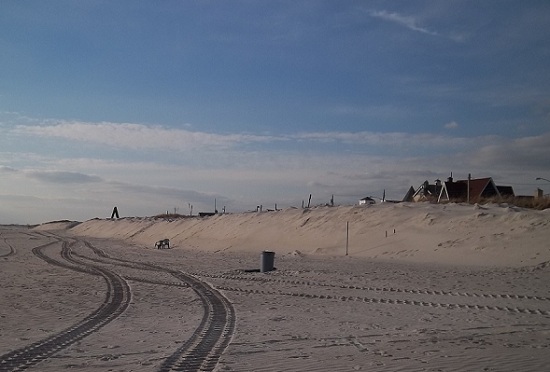 Beach side, it looks like they’ve piled up sand in an attempt to temporarily replicate the missing dunes. 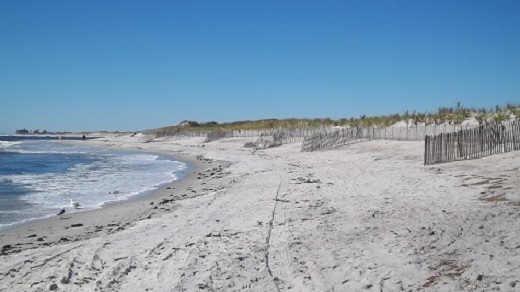 re: our dunes, we reiterate that it is vital people stay off of them!! 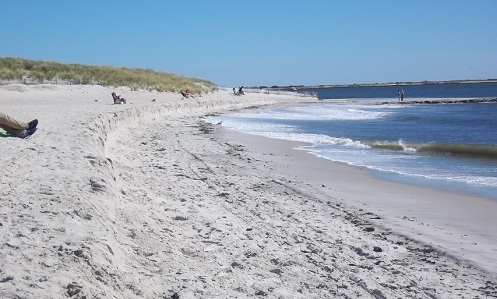 The dunes protected our town from the ocean, in part saving us from the degree of damage experienced in Long Beach. 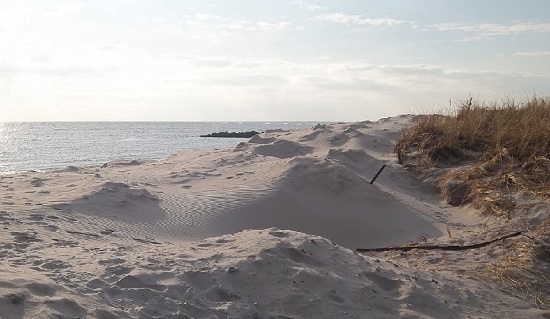 While the dunes served us well during the storm, they are fragile. Walking, playing, etc. on the dunes can easily break the roots of the plants on the dunes. Once these roots are broken and the plants die, the strength of the dune is wiped out. Dead plants equal worthless dunes. 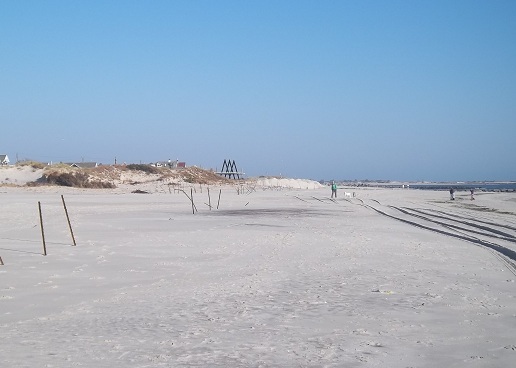 There have been numerous, unsettling reports of people walking on the newly exposed dunes, walking dogs on them and even kids boogie boarding down them!?! How quickly some forget their importance, and the fact that until recently there were fences protecting them and signs stating to stay off them. are you getting used to going elsewhere for gas? I’m, NOT! Visible progress being made getting the gas station cleaned up, refurbished and running. 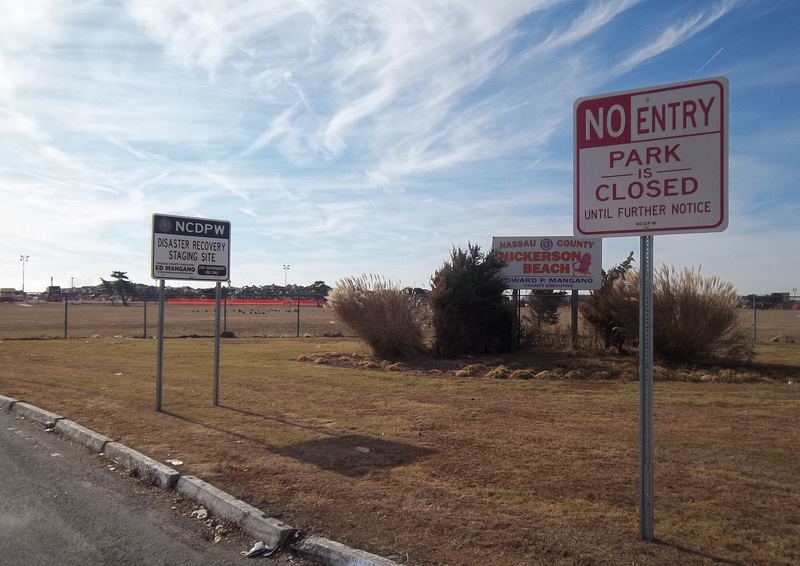 No More Library in Point Lookout? 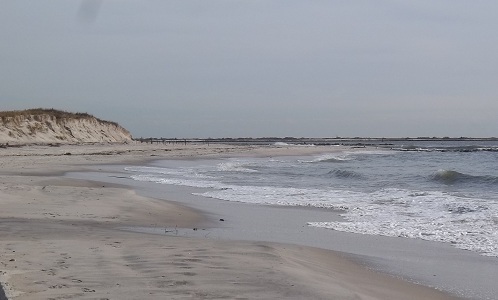 The Long Beach Library will hold a special meeting in the High School Library on Wed. Nov. 28, 2012 at 7:30pm to discuss “the future of the Point Lookout Branch”. As you are likely aware our branch remains closed. We urge attendance by local residents to show that the branch is important to us and we care about its future. 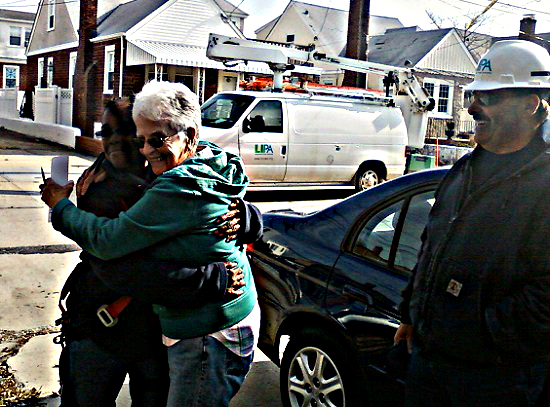 Pat thanks LIPA workers Cathy and Frank, who re-restored her power after fixing an issue on the line. Actual LIPA workers have been in town getting out the kinks in the system in the wake of Hurricane Sandy. LIPA worker Cathy above has been working tirelessly, while she still has no power herself, in Long Beach. A few people who are ready were still trying to get their power restored as of yesterday. It turns out on more than a few blocks, homeowners turned on their electric service breakers BEFORE they got their power back, causing a massive load and immediate automatic disconnect to their and their neighbors’ houses. Electric power has been restored to most of town as of 5:30 this evening. 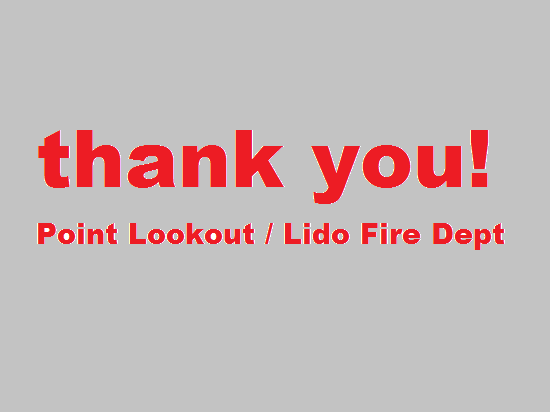 to the Point Lookout / Lido Fire Department who organized, advocated for, watched out for and informed the entire town throughout this ordeal. thanks too, to all the volunteers who helped throughout. so many people helped us out, including so many people from out-of-town, and we are greatful. Thanks to the herculean efforts of the Fire Department, some of you may already be aware that power has started rolling into Point Lookout. 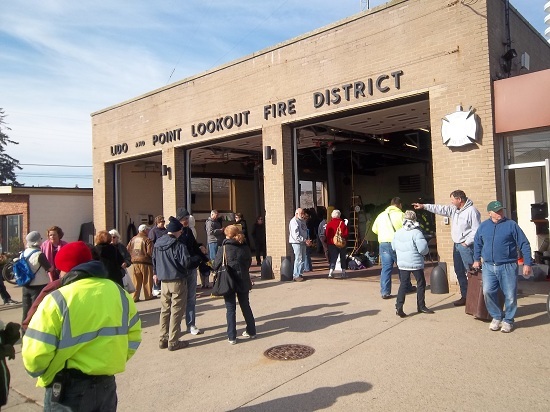 The FD first was able to extricate Point Lookout/Lido from Long Beach to speed the process toward restoration, then with the help of local volunteers successfully undertook the task of required home inspections. The amount of progress made during the past 48 hours was nothing less than spectacular, and unexpected just days ago even by those involved. As of now, power has been restored to most houses south of Lido Boulevard and the expectation is that power will be restored north of Lido by end of day today. THERE ARE SOME EXCEPTIONS, some houses will be without power for various reasons. But much of town is on track to be restored. Important instructions: to turn your power on, first turn on the main breaker switch. Wait about five seconds. After waiting you can turn on the rest of the breakers. If you have any questions or concerns please go down to the fire house and they will help you. Better to be safe than sorry. – Much remains to be done. Some neighbors still don’t have power due to electrical/gas/other damage to their homes. Our local merchants must rebuild as well. And of course so much remains to be done to our west it boggles the mind. For those who can, continue to help however possible. ok, so after 8 days, trying to conserve gasoline i’m finally back with a full tank of gas, headed out of town to get back on the internet with an update. i’ve been pretty busy anyway! Point Lookout and Hurricane Sandy Day 6 (Friday). Woke up at about 4AM, figured a good time to go get gas. My wife insisted she come. I don’t argue. Best decision all day. Off we go to Rockville Centre. Freeport gas station closed, doesn’t stop abouit 75 cars lining up down Merrick Rd. We Keep going. Just before Rockville Center, we come across the line for the Hess station(yes, the line goes all the way back from sunrise Hwy, down to MerricK Rd, the goes for about 4 blocks east on Merrick. It’s only 4:45 am. We decide to plug on and check the Gulf Station. The ;line is around the block. We get on it and since we are all the way around the block back at the station, my wife gets out to see what’s up. It’s us people waiting on line. “Pumps “may” be working in half an hour”, “no gas”, “delivery coming this morning”. This is not the telephone game down the line… it’s the word IN THE Station. We decide not to waste our time and 1/4 tank of gas waiting. 4:55 am As we approach the Meadowbrook, we decide to see what’s going on in Merrick-lights are on. 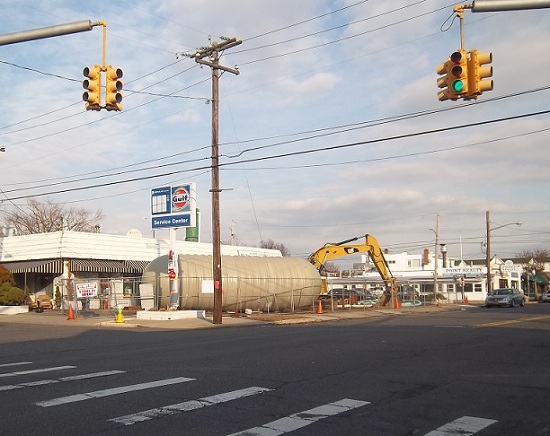 A little further in and we see the Hess station at Sunrise and Hewlett is pumping. We go around the block and get on the line which stretches to the closed Gulf station at Merrick ave, and turns south about 2/3 of the way to Merrick Rd. My wife decided to take a walk and check – and the people at Hess have enough gas. After about 2 hours, just as we reached the Gulf station, the fire department pulled up and started directing traffic. It turns out another line has formed down Sunrise Hwy. My wife went to see what was going on and Merrick FD said they were helping the Gulf station open and directing traffic. In 10 minutes we had filled the tank and were on our way. Thanks to Merrick Fire Department for taking the fight to the numerous line cutters that tried to sneak in, just in the few short minutes we were in the station. Medicine run, and a few minutes with heat and internet to answer some of your questions on our facebook page. Then back to the point for more clean up. Point Lookout and Hurricane Sandy Day 7 (Saturday). Big thanks to our neighbors who were able to share a half bag of Ice with us. Keep us going a few more days. Off to Island park to check on family. They’ve been getting water and meals ready to eat(MRE’s) from the school over on Warwick. They’re OK. We start planning contingencies for the possible Nor’easter they’re talking for this week. 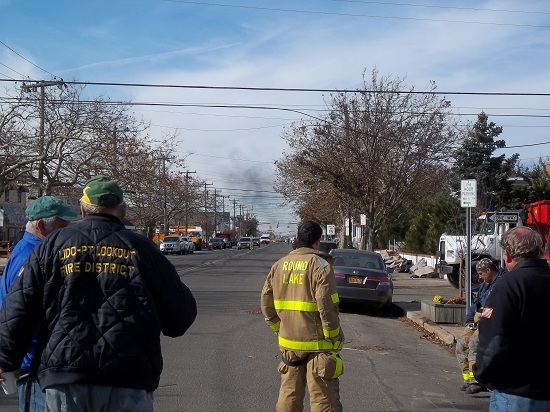 Rumor in Island park is that the LIPA power station(you know the big smoke stacks by Kohl’s blew up as 9 feet of water poured into it- just a rumor, we have no word, but it sure would explain why no one has seen a single LIPA truck anywhere down here yet- there’s no power anyway. On the way back, friends in Long Beach have arranged to help our friends there. They’re on the Ocean side of town By Pine St. they did already pump out. The high water line is about 2 feet over their houses ground floors. By the time we get there they’ve already decided Pretty much everything is gone other than clothes and small belongings. Looking up the blocks, it’s just a mess. Sand is everywhere, peoples’ soaked belongings, now garbage, line the streets. Almost every car you see parked in the street is done-flooded and dead. Seriously, this is just one small step below the pictures we saw of Hurricane Katrina after the waters receded. 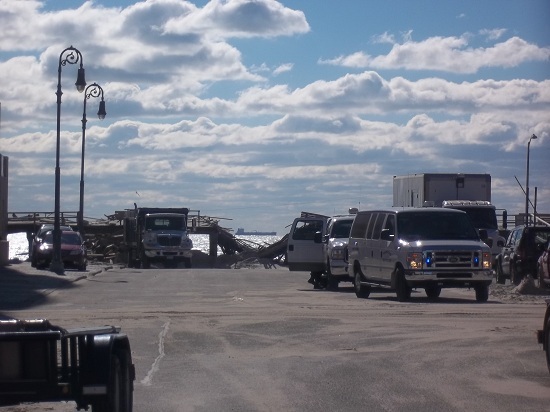 what’s left of the Long Beach, NY boardwalk at Lincoln Blvd- youre not supposed to be able to see the boats out there! I look up Lincoln Blvd towards the ocean and can clearly see a tanker boat out in the ocean. I’m not supposed to be able to- the boardwalk, the berm underneath, and the wooden wall beneath are GONE. Back into town to find a town meeting going on at the firehouse with over a hundred people. How they heck do people hear about this stuff…? They give a daily briefing now at 12 noon, but are sure to remind us all that the information is changing as they speak. 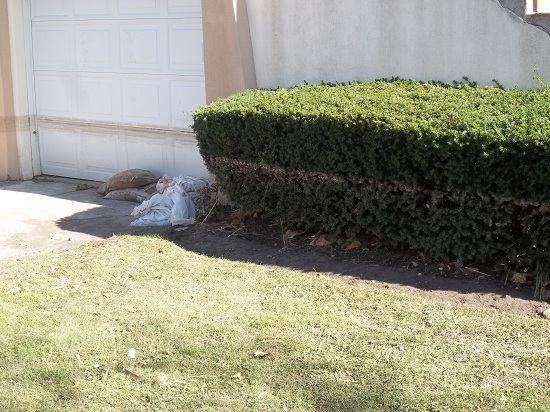 FROM THE CURB ONLY- you must put it at the curb through next week! At this point, we’re doing everything we can to conserve gasoline, maybe we can make it thru until after the lines dissipate when the power is back on. That seems like it may never happen. Point Lookout and Hurricane Sandy Day 8 (Sunday). Temp got down below 40 last night and it feels like it. Add to that we’re letting all our stored geothermal-ish heat out our crawlspace to let the dampness air out. The air coming out is markedly warmer, I can’t believe it’s not “steaming”, like my breath. We know we have to come up with plans for the coming week. Electricity is not likely back soon, and with the clocks going back, it’s dark in the house by 4PM. After some consideration, we’re planning out meals so they can be started in daylight by yours truly, with plenty of instructions. 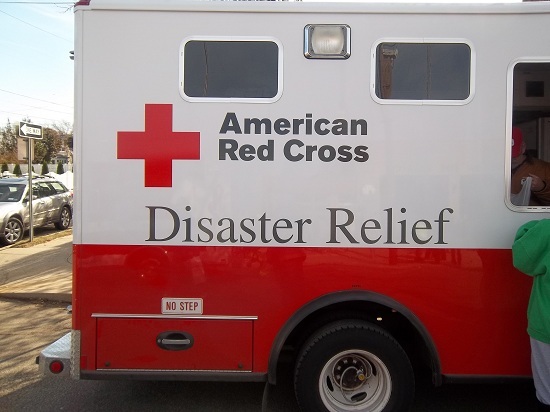 American Red Cross Relief truck with some sandwiches and fruit. 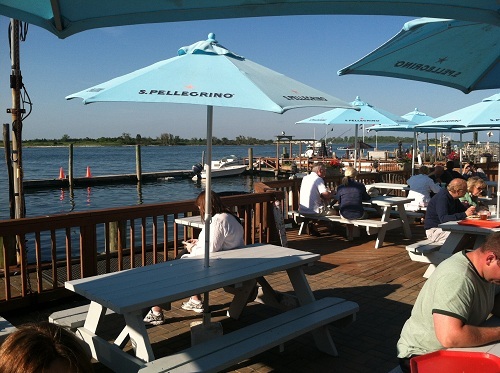 We hear they even had some hot dinners some nights at Nickerson Beach! 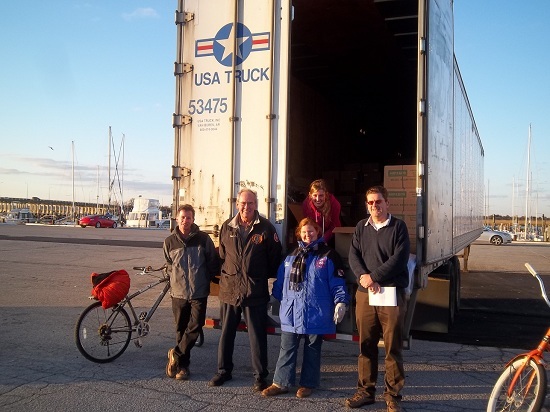 We trekked down to Nickerson Beach and met people from the American Red Cross, giving out blankets, sandwiches and fruit. The person who helped us is from Biloxi, Mississippi. 19 hours later, he’s here making it happen for local residents. His southern demeanor is pleasant and welcoming. We can’t refuse his offer of turkey sandwiches and plums (our cold cuts and fruit ran out days ago, and it would just be impolite to decline! FEMA, through the Point Lookout Civic Association started giving out MRE’s at the East Marina, where several hundred meals were handed out. No one else from Point Lookout Civic is able, so I step up and take charge of The food distribution. Meeting some awesome neighbors who are also pitching in to make sure no one goes hungry, and hopefully forgotten about..
Special Thanks to Leo, Mary, Elaine, and others who I failed to take names (give me a Ring, i’ll put you on!) helped out on Sunday. As of right now, you can go to East Marina from 1PM to 4PM and get MRE’s: self-heating hot meals you can take home and heat up when you want them. Most packs include one of 7 entrees that heats itselfup with a little cold water added (by chemical reaction). The one’s I saw also include crackers, jelly, a pop tart, and some candy- Covering the 4 food groups… Ok maybe not equally, but it’s a hot meal none-the-less and a good one I hear from those that have tried. Maybe I will later. We’re still trying to eat certain perishables before they’re no good. The only saving grace of the 40 degree temps. Point Lookout and Hurricane Sandy Day 9 (Monday). Inside house Temp-57. Ok, we bounced back a little. Not sure how, but I’ll take it. The post office has reopened. And there’s little mail sorted out yet. They did tell me they had a couple inches of water. I was afraid to ask if anything got wet. It doesnt look like it! After some general clean-up and getting the crawl space and garage open for airing out, I’m up on the roof to assess the shingle situation, or lack thereof. All things considered, losing a few shingles is no big deal and in about an hour I’ve got the old ones dug out, new ones put in, and a little bit of goo (yes, that’s a technical term) to make it all stick together, in lieu of the sun heating up the tar strip and melding them together: that isn’t happening in the 42 degree weather. Up to the East Marina again for our 1-4 food distribution. hoping we can reach more people in need, and we have a good few takers. thanks for the help to Dave, Aishling, Mary, Erin, Leo, Marie and everyone else. The volunteers are giving away some meals and blankets, but concern is that they’re not reaching the people who may need it most. If you know anyone homebound or any otherwise may need some assistance, please get down to the East Marina and just bring them a box of meals. No one should go hungry – we have the supplies. Got resupplied (coffee!! And ice!) and did an assessment of the fridge. Normally I’m pretty frugal, but it’s all just gotta go. It’s skeeving me out so anything opened, perishable (past tense) etc just had to go. Hey look-an unopened jar of roasted peppers left! Point Lookout and Hurricane Sandy Day 10 (Tuesday). Down the firehouse to charge up this laptop and my phone which hasn’t had more than 2 of 4 bars of power on it since the beginning of the storm. While there, we heard the call for a fire at Park Ave and Franklin in Long Beach, which was clearly visible before the call came in. Everyone is to vote at the Molloy Rec hall instead of the usual firehouse. Goes for Lido as well, instead of the school. 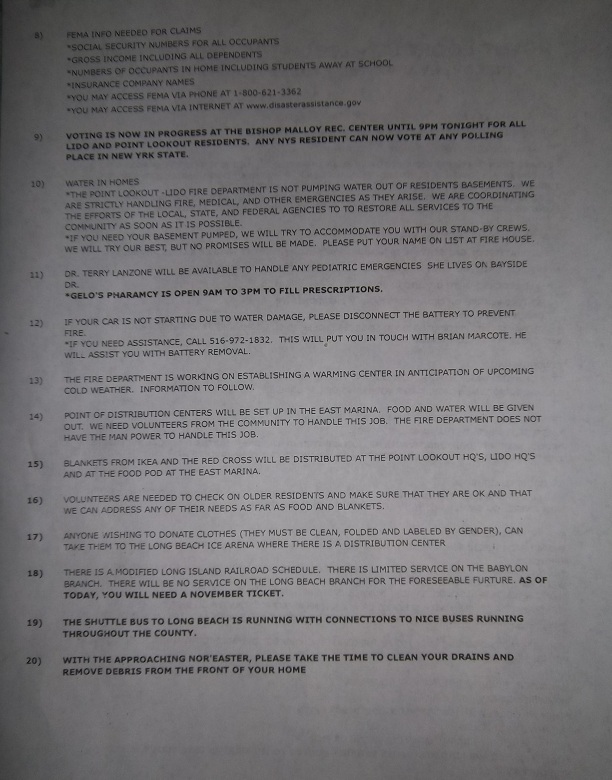 The school won’t be habitable for 3 weeks or more… so no voting there. We’re getting ready to hunker down again for the nor’easter headed in for Wednesday and Thursday. Hope we can hold out, keep the cold out of the house in the 40-50 MPH gusts expected. Stay tuned. Up to the East Marina again for our 1-4 food distribution. hoping we can reach more people in need, but it’s a little quieter today. thanks for the help to Dave, Marie, peter, Don, Sasha, Brian and everyone else. With the upcoming nor’easter we’ll have to see what’s in store tomorrow. Point Lookout and Hurricane Sandy Day 11 (Wednesday). Heat Center to come and get warmed up. Serve as location for Town Hall-style Fire Department updates. by 10am it’s snowing, the 12:55 high tide is well below the marina’s bulkheads and FEMA cancels the food distribution. word comes through at the noon briefing – that every house needs to have its electrical system checked before the power can be turned on. we all know that the 45 degree temps never come, our noreaster hit in the mid 30’s and by 5pm it’s all snow. we have about 2-3 inches, I saw about 4-5 in Island Park. Point Lookout and Hurricane Sandy Day 12 (Thursday). this is kind of getting to me. now i’m going to have to make sure I’m home for this electrical inspection?.. 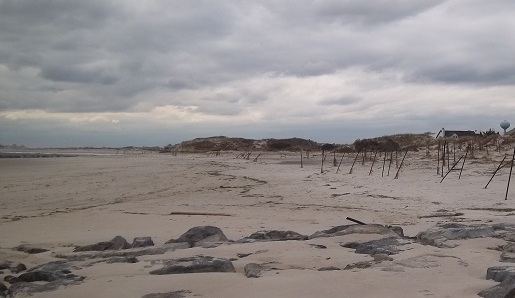 to assess damage from the storm surge but when?? what the heck is going on? am i supposed to sit here all day and wait… what?? You know to be careful what you ask for! I head down the the firehouse to find out “what’s going on with these inspections” and I am drafted to help the firemen do these “electrical surveys”-whatever it takes to help get the power back on. Most houses are in good shape. Obviously, many have some slight water damage and need to be looked at by an electrician, only one I see that cannot be hooked up to electric until their electrical service box is completely checked out and approved by a licensed electrician. Sorry, I have no pictures and wouldn’t take any obviously, for privacy reasons, but someone did take a picture of me at their house – feel free to pass it along. hopefully I’ve done my part to get the power going. Ill update as soon as I can. Hopefully from the comforts of my own, electrified and heated home. Fingers crossed, and not just to keep them warm!